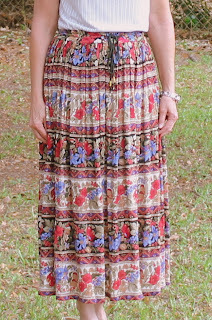 Lisa's Carolina | Handmade: a new outfitNEWLOOK 6108 Skirt & Kirsten Kimono Tee ~ again! NEWLOOK 6108 Skirt & Kirsten Kimono Tee ~ again! A new top and skirt have been made. ....of which I made a skirt. 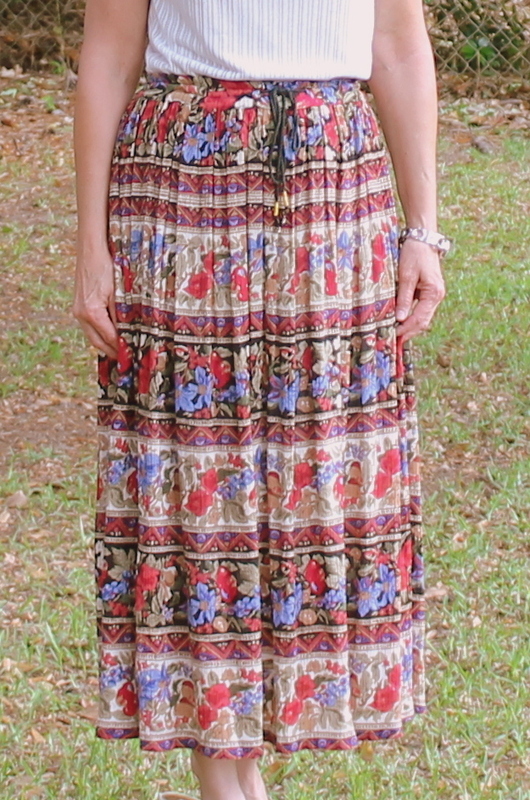 Did I succeed in 'copying' my rtw peasant skirt? No. My skirt looks nothing like a peasant skirt. Do I love it? A resounding YES! This skirt was such fun to make! I've made this pattern before and knew the fit, or so I thought... but wait, I'm getting ahead of myself a little here. Using my size 10 pattern, traced and re-cut it out of thin interfacing, which has become my favorite medium to use when tracing patterns. You can see in the photo below, I lengthened it 5". Back, photo below. As you can also see, each piece had to be cut in mirror images of each other. Let's see how we did on the stripe placement. Not bad. It's hard to see in the photo below, but the stripes, after careful pinning and slow sewing, matched perfectly at the seam. Let's compare my skirt to my inspiration photo. This is the look I was trying to achieve with the stripes. On the opposite side, the stripes just kind of disappear into the seam. Sorry my hand is in the way, photo below. All seams are serged with the hem of both lining and skirt a 1/4" rolled hem. Lining was cut from the original pattern piece, thus is @5" shorter than the skirt. 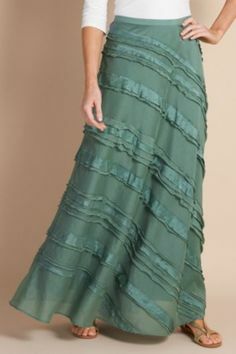 At this point, all was going well so forged ahead and attached the waist band to the top of the skirt, after already adding the lining, to find.... I could not.... get it over.... my hips..... at all! I'd forgotten this pattern is for knits and my previous skirt I'd made was a knit! What to do.... What to do...! Proud of myself that I didn't spend too much time pondering (i.e. procrastinating) on this problem and quickly came up with a solution. Picked the waistband off and sewed a 3/8" elastic right on the top of the skirt, as I knew I could get that part on, using the quartering the elastic with pins, then matching the pins with sides, front and back of skirt method. Then turned down the elastic-sewn-to-the-top and tacked it in place on each side and love this look even better. No waistband stripes to compete with the skirt stripes. See how nice and clean it looks in the photo below. I may need to tack it in a couple more inconspicuous places, but for now all stays tucked in pretty well. .....along with a view of the back. Our chickens were so interested in the photo shoot this morning! They kept peering out the side of their fenced-in yard to see what was going on. They are very social. 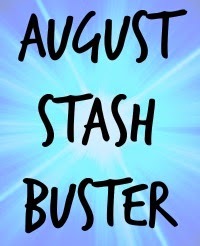 The skirt fulfills my Make a Garment a Month Challenge for August and also fulfills August's theme of 'stash buster' as this fabric has been wanting to be made into a skirt since last year. Now, let's turn briefly to the top. Another Kirsten Kimono Tee.... my 4th... what can I say.... love 'em!! The free pattern from MariaDenmark can be found here. This is my modified version flaring a small at the top to a medium and narrowing the neck by 3/8". This is a nubby, stretchy, soft creamy knit fabric that tricked me, just like the last one, with being sew through once I had it made, sans finishing the neckline and hem. Lined it with a medium weight white jersey, serging the armholes together and turning in 1/2" treating as one fabric. Top-stitched the neckline 1/2" as the jersey knit kept poking out. What is interesting about this skirt, is that it was supposed to be a casual-feeling, peasant skirt-ish, throw on to wear anywhere, kind of skirt.... and instead feels... 'nice'. I wanted to wear it to the mountains this past weekend, knowing we'd be making some short hikes, but after putting it on to get ready to leave, it felt too 'nice', so it was switched out for another pleasant, casual-feeling skirt. In contrast, this outfit was chosen to wear to church on Sunday, coupled with an unstructured chocolate brown rtw suede jacket, and it felt perfect. So, I guess, this is now officially categorized into the 'nice skirt' section of my closet. Wanted to leave you with a photo taken of something that gives this Southern girl great pleasure - ripening Muscadines on the vine. Muscadines are the Grape of the South and make into the best jams and jellies, which is what I will be doing as soon as this post is published. They are also delicious eating fresh off the vine. Hope all is having a very good August day! The skirt turned out great! Nicer than the inspiration, IMHO. I see what you mean about being in the "nice" rather than "casual" side of the wardrobe, but it still looks so comfortable and breezy. Love the stripe matching! Your skirt & top are both great, and the chain belt looks perfect with the skirt. It's a lovely skirt. The stripe placement turned out so well! And I really like your elastic waist that doesn't look like an elastic waist, if you know what I mean. Your explanation of how you did it was so clear, I understood it perfectly. I'm going to have to borrow your method one of these days as I love wearing elastic waist skirts. I was hoping my explanation wasn't 'clear as mud'! I could 'understitch' the turned-down lining to the elastic in a separate seam, but am afraid it would shred my lining's thin fabric. Interesting this is generally staying all tucked in well though. You are right, it hadn't occured to me that it doesn't look like an elastic waist at all..... yes, I like that too! With the width of the woven fabric's 'waist', I can just barely get it over my hips, so am thinking that is why it doesn't gather too much at my waist because there's not that much excess fabric.... and what is, is kind of 'hidden' with the elastic tucked in and tacked at sides, but not top-stitched. Thank you for helping me think that one through Erin! A lovely addition to the "nice'' skirt collection. It is a lovely skirt, and I do like the waistline finish - what a good idea, and thrilled for you that it worked, after all your effort cutting out the stripes to match. The t shirt always works well for you. I'll have to try that pattern later this year. I'd worked too hard on that stripe placement to not make this skirt somehow, someway!!!!! You will probably like that pattern. An easy sew, for a little tee. Thank you Sarah Liz. You know Tracy, I think that is what made the process so much fun! Thank you! Another flirty skirt! I love the stripes and your attention to detail on placement. Nice outfit! Hi Lisa! What a beautiful model! And the skirt and top is cute too! I am trying to get into a size 10, but my efforts are so futile! I think hormones are winning over! You look great! Love the challenge! You are such a creative lady! Thanks for sharing! Blessings from Bama! You are so nice, Felecia! Thank you!